Summary: When Tara’s championship-winning baseball team finds themselves in their off-season, a goading dare from a local boys hockey team nudges them into becoming hockey players. While they have the skills, the politics behind playing on a girls hockey team quickly become apparent as they face one obstacle after another: the loss of their coach, limited ice time and outrageous practice hours. As the dare becomes a bet that involves having the highest standings in their respective leagues, Tara and her friends face extra discrimination as they must fight for the right just to play the games they have scheduled as opposed to only focussing on winning them. Their struggle for equality on the ice infects the community; challenging long-held beliefs about who belongs in sport, and what being equals really means. 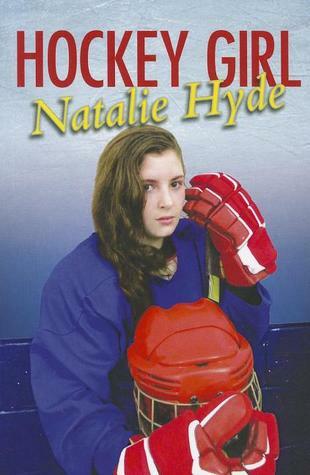 Review: I admit to prejudging Hockey Girl by Natalie Hyde. Some books on my Marathon of Books I look forward to reading, and some I don’t. I tend to shy away from books about sports because it is one of my least favourite genres. But the old adage about the folly of judging a book by its cover proved true today as I found myself immersed in an empowering tale of female equality. Hockey Girl is more than a simple sports book, it is a sensitive and thoughtful exploration of the institution of hockey in Canada and the double standards that exist for female and male players. Though the book is about Tara and her team’s struggles, I love Hyde’s juxtaposition of Tara and Kip, one highly discouraged from playing the game, and the other encouraged to the point of obsession. They share similar feelings and frustrations for different reasons, which leads to their easy connection and attraction. Tara and her team face challenge after challenge, constantly having to rise above and prove themselves as serious athletes. When their ice time gets cancelled because too many male teams need it, the team challenges the status quo and shakes things up with a t-shirt campaign. Simple, yet effective, the t-shirts feature an equal sign, indicating that female hockey players should get as much ice time as their male counterparts. The shirts spark a community discussion about equality, putting pressure on those in charge, and the revelations of key characters wearing the shirts was immensely enjoyable. Hyde keeps levity in her tale with the bet between the girls and boys hockey teams. The stakes of having to cheer on the other team all season long in a predetermined costume is perhaps unfairly balanced with the guys’ insistence on a revealing outfit for the girls if they lose, but serves as a huge motivator. I like Hockey Girl as a pick for teen girls of all ages, because its’ message of the importance of fighting inequality is powerful and moving. Inspired by real life events (see http://www.fitzhenry.ca/HockeyGirl/ ), Hyde’s book reminds us of how far we still have to go when it comes to being equal. My dad’s mouth hung open. Hockey Girl by Natalie Hyde is published by Fitzhenry & Whiteside, (2012).